Home Tech Who Do You Think will Win Between iOS 12 and Android P? Two most highly discussed and debated smartphone technologies, iOS 12 and Android P are coming out together. Although both Google and Apple are located hardly a few miles away from each other in the heart of Silicon Valley, their ideologies and working are poles apart. While iOS is well-known for its sturdy performance and secured network, Android is contested to be the most flexible platform ever built. Google’s Android is all about convenience an openness, while Apple’s iOS focuses on making the system work while still providing an extremely strong security. Google’s Android P is already out on many Android devices. While iOS 12 is still in beta. We can evaluate and compare the features here. But we are sure both Google and Apple have left out some of the major surprises to be announced at the actual launch of their devices. Let’s see how and on what basis can we compare iOS 12 and Android P here. The Siri upgrades on the new iOS 12 will allow your iPhone to predict what you want even before say it out. There will be a new app called Shortcuts that goes through a step-by-step routine based on certain keywords that you say. But compared to Siri, Google Assistant has got a lot to offer. It allows you to set a routine among many other functions.In order to make the Android P more convenient for its users, Google has developed six new voices for the voice assistant. Taking it a step further, Google is also working on making it smarter to take appointments for you on your behalf. The Shortcuts app on Siri will do something similar, but it is still lagging behind. iPhone X was definitely not the first ever phone to either sport a notch or have swipe gestures. But it was definitely the first to make it popular. Google is adapting the same notches and swipe features on its phones. Google’s support is a good sign that Android phones, with both notches and gestures, will keep coming. Android Pie cannot entirely rely on gestures though. It still has to rely on the back button. This makes the experience feel incomplete, not exactly the way it is iPhone X. Android phone makers like to leave a mark of their own, they do not promise to completely get rid of the notch and gestures from their future smartphones. There is a central notch and a corner notch on Android Pie, along with a notch on both the top and the bottom of the screen. With every update, Apple’s iMessage keeps on getting better. On one hand, we have Animoji, Memoji, FaceTime video calls, texting other iMessage users, peer-to-peer payments, cross-platform SMS texting etc. But with Android, we have what? Google Hangouts, which was trying to be like FaceTime, is very limited. The Android Messaging texting app was made available only recently. Google Duo makes good phone calls, but only on your phone and tablets, you can’t use it on your desktop. Android just got its own version of Face Unlock. But it is not as secure as a fingerprint. But secure face unlock is something Apple does. iPhone X was the first phone from Apple to use a 3D front-facing camera. 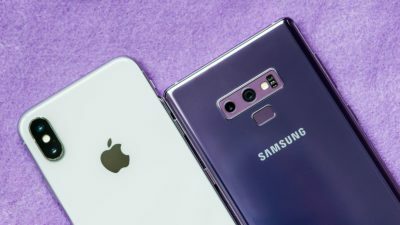 With the new version of their operating systems, both iOS and Android have brought massive changes to provide you with more control over your own phone. On iOS 12, you get to set the apps to deliver the notifications quietly. Both the companies are coming up with new features to allow you to manage how much time you spend on your phone. Who Do You Think is Winning Here? Even though Android Pie has launched on majority of phones, Apple’s iOS 12 is still running in beta. There are a lot of surprises you can expect. It’s actually still very early to decide which one will be better based on the beta versions of the operating systems. We are really expecting Apple to fix Siri’s flaws with the new updates. Both iOS 12 and Android Pie seem to be really strong with their new features. Let’s hope both Apple and Google keep us excited and surprise us with their updates and contact our team of android app development experts, today.